Whoa Terry! I'd never registered with the Lixit product before (not that I didn't miss it). Will keep my eyes open now. Like masseyfarm notes, we use a rubber mat with raised edges. 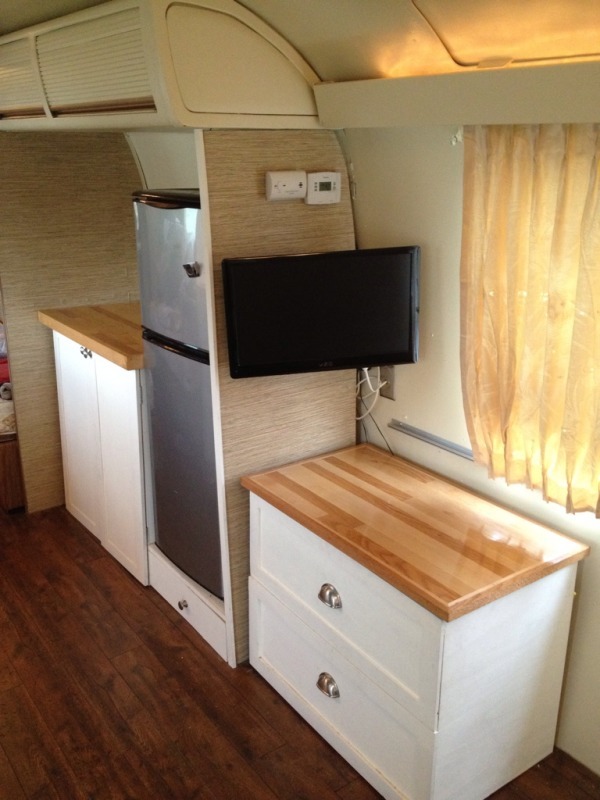 It fits a bit into the furnace fresh air intake recess under the roadside couch just forward of our rear dinette. Our RV dog dish has a top that curves back down into the water bowl and thus returns splashes back to the bowl. An airedale's beard will broadcast maximum water of course and defeat the best intentions of mere mortals. No pictures until we begin preparing for a trip slated a couple weeks away... sorry. Our Giant Schnauzer (88 lbs.) has a plastic stand for the 2 bowls and raises the bowls about 8". This goes in the shower. The little 10 lb. one also uses a small metal 2 bowl holder that goes in front of the ref. Try a no spill bowl with a smaller opening for them to lap the water. Sir Blaze Foxhall, Let the Games Begin!!! The more I try to understand people, the better I like my dog. We have a male, cocker of about 25 pounds, a female "Arkansas Sheepdog" about 35 pounds and a "Dungeness Malamute" hitting about 100 pounds. We have a "spongy" pad about 18" by "34" that we put beside the pantry/oven area. It fits well in the little niche and they all seem to be able to take turns and it is easily refilled as the kitchen sink is so close. Actually when we first come in from a long walk I will often fill up all three of their bowls with water and let them drink some water. We do have to watch out as the Malamute will just keep drinking until he makes himself sick. They all have a place to sleep as well. The cocker underneath the table, the sheep dog beside the bed (we have the king size bed but there is still room for her and the Malamute "where ever he wants". They do well! Lily has a double bowl for water and food, kept near the door on a folded hand towel to absorb water slops from her or from travel movement. Towel is hung to dry when we are parked for a day or two, and washed weekly. The hinge side of the front door. That helps avoid anyone stepping in it. We just returned from 4 weeks on the road w/the Rastapoodles and it was great. When we left the girls in the trailer, we DID leave the water bowl on a stand in the shower. It took all of 3 minutes for them to figure it out. Most of the drips, slobbers and motorboat, messy drinking was captured in the shower stall. Many thanks to my wonderful husband, John Barlow, for removing the shower door for me. The shower curtain works great and is way more attractive than the gold shower door that always leaked on the floor. I can change the curtain on a whim. on the floor in front of the fridge. Center or rear bath? If center, would u mind posting a pic of your curtain and rod? I build a sliding storage container that serves both as their food and water bowls. We store their dry food in the open cabinet underneath the bowls and thankfully they aren't too bad in the slobber department. We have a german shepherd and a lab mix. Here's a pic of it closed. Nice solutions all! We have a 50# airedale and a 24# English cocker. This works very well for us. The Road Refresher water dish doesn't slosh out if we keep it no more than 2/3ds full. I removed a veneer panel on the street side between the sink cabinet and the hanging locker. It revealed an unused space about 9" deep, 4" wide, and 12" high. 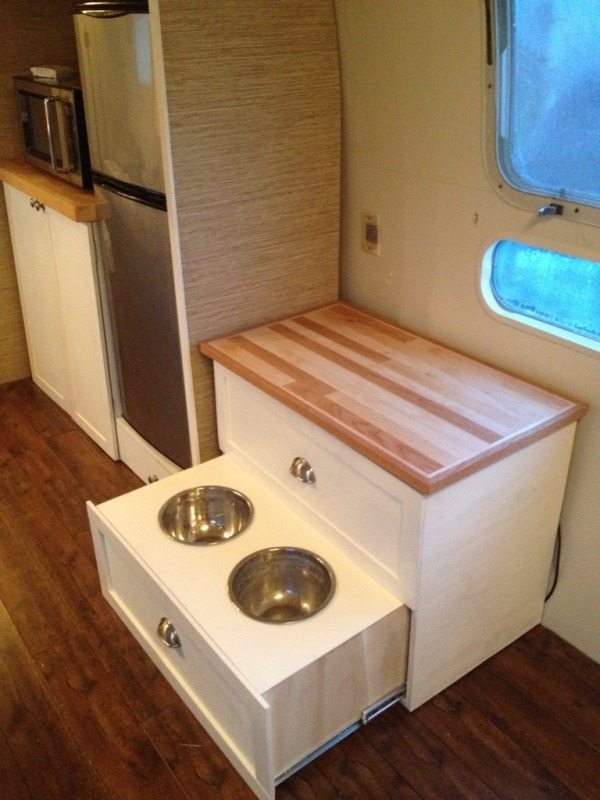 We place two stainless steel bowls side-by-side in this recessed area and its perfect for Jaki's food/water needs. The flooring is a rubber interlocking tile material over a vapor barrier covered waterproofed subfloor. Like your floor. Who makes it? What sort of vapor barrier did you use, and did you treat the subfloor with poly to make it waterproof?